This cow is a placid animal that lives in herds on the plains of Mata Nui. Although peaceful by nature, it is quick to react to danger. 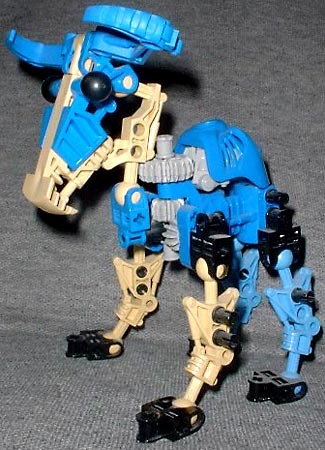 Opponents would be wise to beware the Mata Nui Cow's horns and hooves, which it can wield with suprising speed. When I first saw this set, I pronounced its name "mu-KAH-oo," because that sounded like the same sort of Maori terms that the rest of the line employed. Eventually it was pointed out that you could also pronounce it "moo cow" like the bovine that it is.